Photos show the actual items you will receive. ​Approx size - including ears - 18". Sitting height, including ears - 12"
​Hares are not free standing. ​​"The Knit and Natter Club had all finished their jumpers so it was time to start a new project and what bette place than in the sunshine with a nice cup of tea"
Note: Tea set not included in price. "All the practicing is certainly paying off" said Bella who had just been picked for the ballet school show. Bella is unique. Hand made from the best quality wool felt and fabrics. ​Everyone likes dressing up and Emma is no exception. Her new faux fur jacket will keep her warm too. Emma comes complete with dress, jacket, necklace and underwear. Everyone loves new pyjamas and Jessica is no different, she has been looking forward to bed time all day. She has never had PJs with bows and lace on before. Cuddling her teddy she can hardly keep her eyes open. Night Night Jessica. Jessica is unique. Hand made from the best quality wool felt, cotton and lace. The weather is so changeable that Lady Dorothy has opted for a short sleeved blouse and a cardigan. Her pleated wool skirt completes her outfit and of course no self respecting lady would be seen without fine quality lace underwear. Lady Dorothy is unique. Hand made from the best quality wool felt. Her ears and feet are Liberty print lawn and clothes made of the best quality wool an cotton and lace. Betty is having trouble deciding what to wear. She has decided it is too warm for a cardigan but her blue cotton dress perfectly matches her new bag. ​With a clean hanky in her pocket she is ready for the day. Betty is unique. Hand made from the best quality wool felt. Her ears and feet are Liberty print lawn and clothes made of the best quality wool an cotton and lace. George knows he is going away, just not sure when so he has dressed in his best outfit for the journey. George is unique. Hand made from the best quality wool felt. 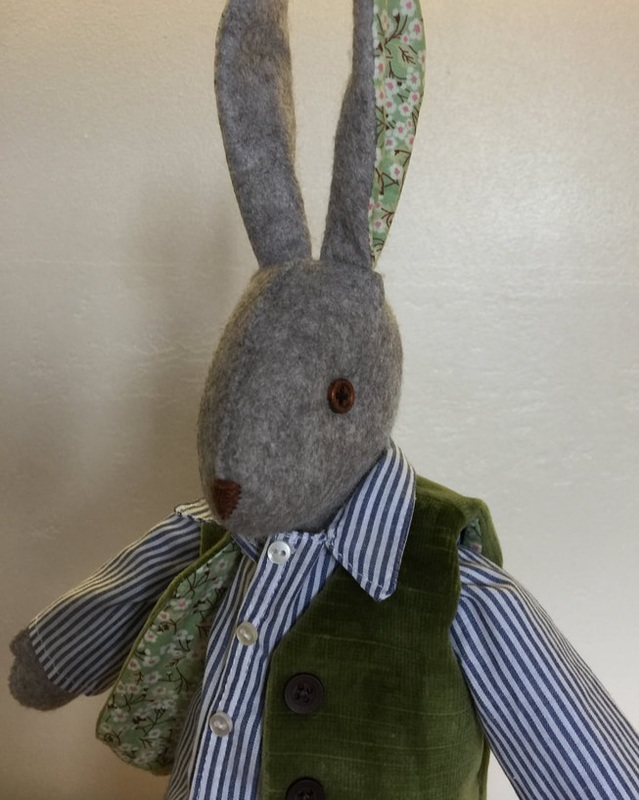 His ears and feet are Liberty print lawn and clothes made of the best quality cotton and velvet. He has just finished a long shift but the customers liked his food so it was all worth while. ​His embroidered jacket and checked trousers complete his uniform. 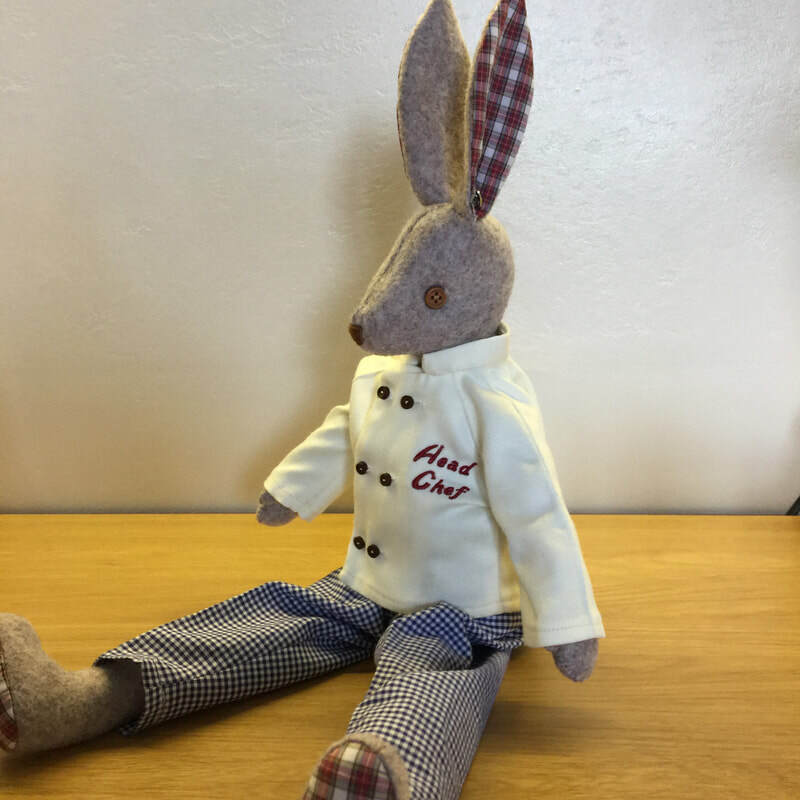 Chef is unique and hand made from the best quality wool felt. His ears, feet and clothes made of the best quality cotton. George is unique. Hand made from the best quality wool felt. His clothes are made of the best quality cotton and velvet. Grace has dressed in her best outfit for the journey. Her cotton dress is her favourite and there is plenty of room in the pockets for her lace handkerchief. And of course no self respecting girl would be seen without their lace underwear. Her handbag is over her shoulder so she is ready to go. Grace is unique and hand made from the best quality wool felt. His ears, feet and clothes made of the best quality cotton. It may be warm but the weather changes quickly so a wool coat and scarf over her cotton frock means she is ready for anything. Luna is unique and hand made from the best quality wool felt. His ears, feet and clothes made of the best quality cotton. Alfie is always smart even on days when there is nothing much to do. He has a whole wardrobe off waistcoats but today he has chosen his favourite green velvet one. Alfie is unique. Hand made from the best quality wool felt. His ears and feet are Liberty print lawn and clothes made of the best quality cotton and velvet. Harriet has dressed in her best outfit for the journey. 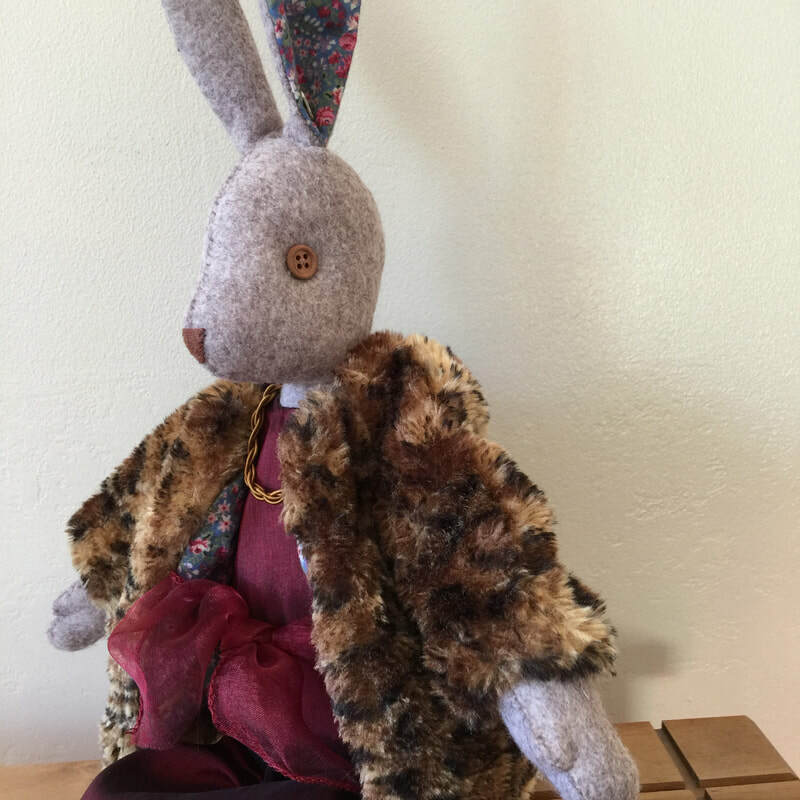 Harriet is unique and hand made from the best quality wool felt. 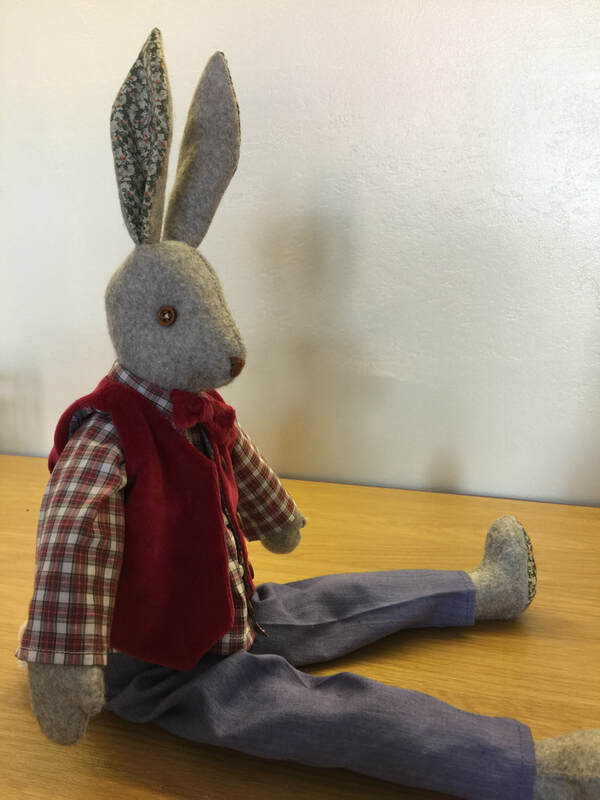 His ears, feet and clothes made of the best quality cotton.